I was prepared to be entertained upon receiving this book and I wasn’t disappointed. I’ve read two of Hy Conrad’s books, What Your Dog Doesn’t Want You to Know and Rally Round the Corpse, both of which were very enjoyable, so I knew that I was in for a treat once again. Adrian Monk is a brilliant investigator, a consulting detective for the San Francisco police department. He also has an obsessive compulsive disorder (OCD) that sometimes threatens to overwhelm him. Fortunately, he is ably assisted by his side-kick and business partner, Natalie, currently studying for her PI license. 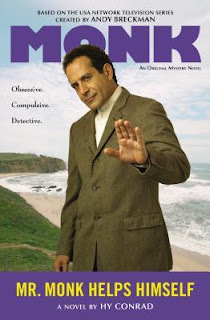 This book is about how Monk and Natalie help the SFPD solve a couple of crimes, one of which involves the murder of a clown – despite Monk’s fear of clowns – number ninety-nine on his list of one hundred phobias! This is funny, highly entertaining reading. Natalie is the narrator and at one point says, “Just last week, he (Monk) was watching Animal Planet and discovered his horrific fear of aardvarks. I don’t know why this didn’t come up years ago, especially since it’s probably the first fear in the alphabet. But, in order to accommodate aardvarks, he had to lump together spiders and insects, even though spiders are not technically insects.” The police captain who is well aware of Monk’s phobias says, “I didn’t think his clown thing was so bad. Isn’t it like one hundred on his list?” “It used to be. Now it’s ninety-nine. Aardvarks is the new one hundred,” responds Natalie. This is an example of the witty dialogue throughout the book. There are accurate descriptions of San Francisco (I recognized some of the areas) and a logical, clever resolution to the crimes. I highly recommend this funny, clean, quirky whodunit. Disclosure: Thanks to Teddy Rose from Virtual Tours for sending me this book for review. I was not compensated in any other way, nor told how to rate or review this product.